This is the perfect gift to make Mom for Mother's Day and is a great group project. John Heywood, the English playwright and poet's quote seems applicable here, "Many hands make light work." The fruit is cut from cookie cutters so, all the kids can help make this arrangement, and it is rather large so I'm sure they can help Mom eat it too. Remember now, don’t go crazy. It doesn’t have to be perfect…it’s fruit. Keep a heavy stainless steel spatula on hand for extra pressure. The unused pieces of fruit left over can be put in baggies and frozen...perfect for smoothies afterword. If you have your fruit and veggies, cookie cutters, toothpicks and skewers, let's begin. Here are the fruits and veggies you will use. 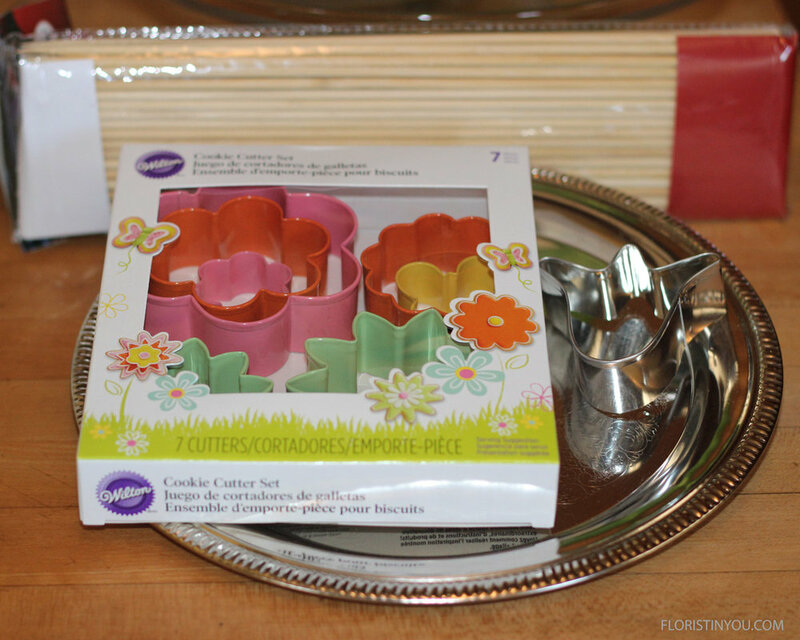 Here are the cookie cutters used. 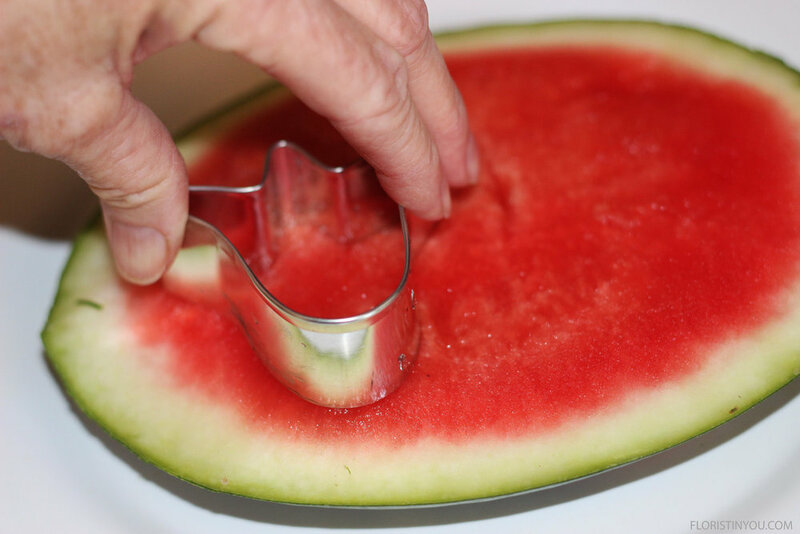 Cut watermelon an inch above half way. Cut the rest into slices the height of cookie cutter. 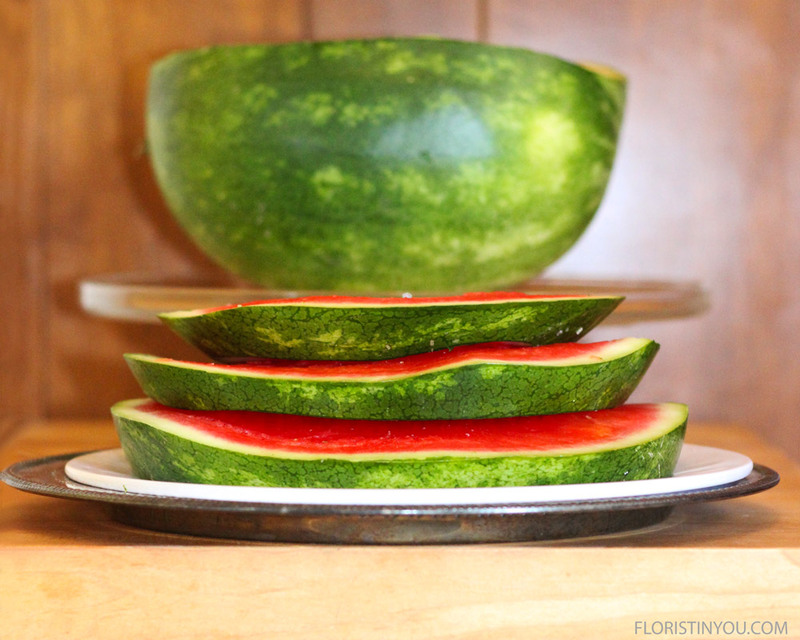 Cut tulips out of watermelon. You may need to press down on a spatula for leverage. Cut edges with sharp knife. Cut toothpick 1 1/4 inch long. Push into blueberry. Add 2 grapes at 45 degrees for leaves. Cut cantaloupe with next to largest pointed flower cookie cutter. 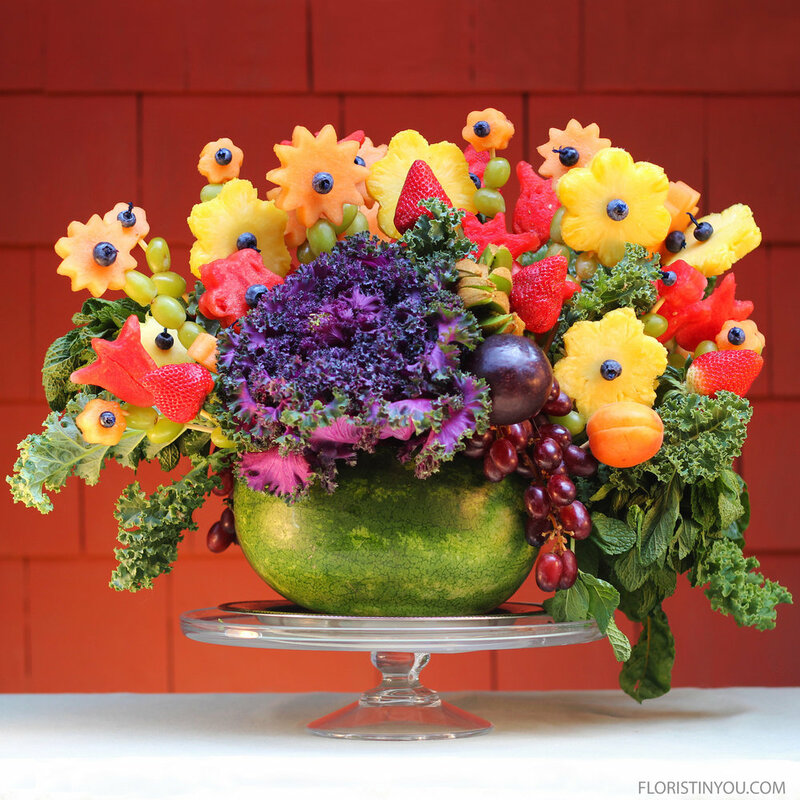 Finish off cantaloupe and watermelon flowers. Use 5 grapes for stems on large flowers. 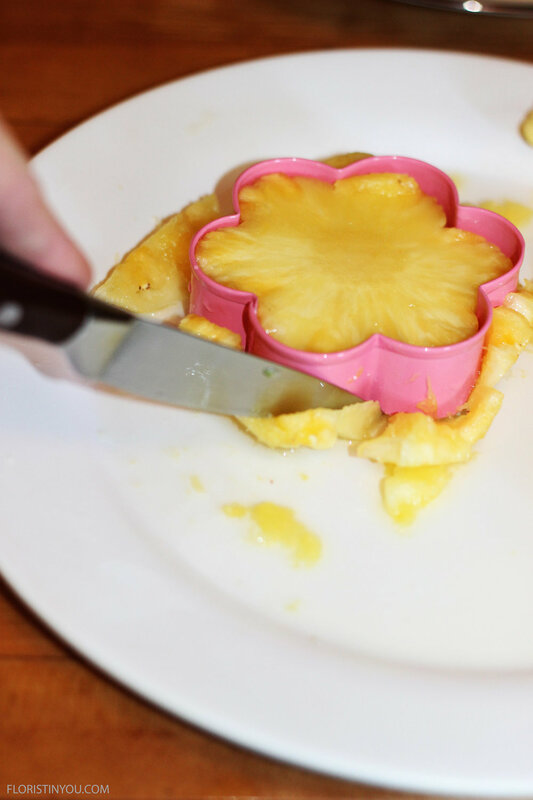 Finish pineapple with centers and 2 stems. 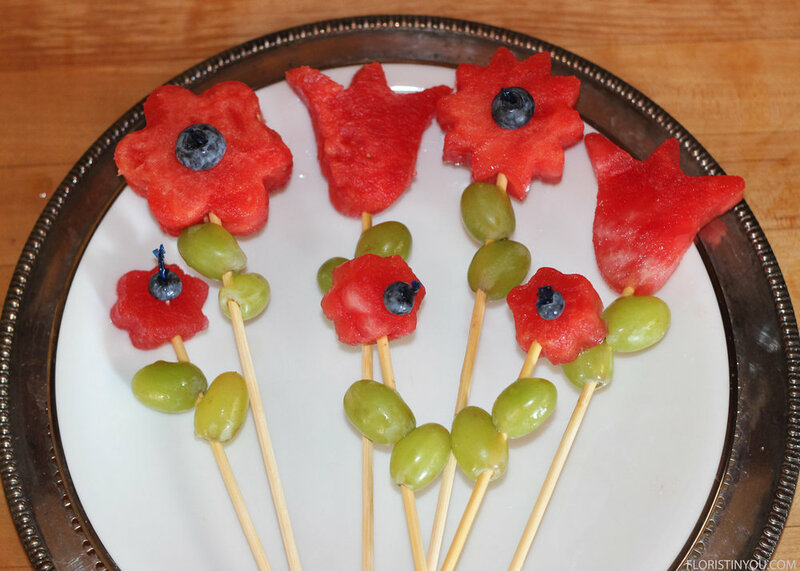 Put skewer into bottom of strawberries. Kiwi flower: Use paring knife. Cut strips 3/4 way down and open up. Use knife to open small hole in bottom to put skewer into. Put skewer on angle into flowering kale. Cut skewer to 5 inches. Put bunch of mint into large vial with water. Make 2. Push Kale in center front and back, and mint on ends at angle. Insert chard on right and curly kale on left. Attach grapes to a wired pick. Make 2. Push grapes with pick on right in front and back. Add rest of fruit flowers. Put apricot and plum on skewer. Cut skewer to 5 inches and push in. Fill in with Curly Kale and you are done. Happy Mother's Day!